ギターの弾き方；撫でてもいけない、たたいてもいけない。　How to play the guitar; never to smooth it or to hit it. They air the video filmed performance by Kyuhee Park at 5：00～5：55 on Feb. 22nd on NHK BS3. 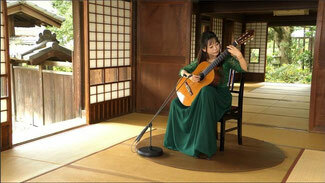 In the program, she plays 9 classic guitar music pieces written above in Japanese. I think she is the top classic guitarist now in the world though she is young.